5 Best Cartagena Shore Excursions - What To Do in Cartagena! 5 Best Cartagena Shore Excursions – What To Do in Cartagena! 1. How about an organic mud bath to cleanse your body and mind? In Cartagena, you can do just that, at the Volcano Totumo where you can soak in mud so thick you get a weightless feeling surrounded by the 100% organic and natural stuff. After a 30 minute soak, head over for a relaxing massage and dip in the lagoon to clean off. 2. Cartagena tours explore not only the ground, but from the air as well on various helicopter tours. Fly over the 477 year old city; see the history from the air as well as the bays, beaches and terrain that make this country so interesting. 3. Take yourself on a walking tour of Old Town, or take a guided tour from your ship. As you immerse yourself in the cobbled streets and quaint walkways, you will see various churches, monasteries, palaces, restaurants and shops, all within the town walls that boast impressive sea views. 4. One of the most popular Cartagena shore excursions is a visit to the La Popa Monastery, circa the 1600’s. This tour allows you to see the chapel, the Statue of the Virgin and the ornate gold leaf altar before you head to the Gold Museum and then do some shopping in the district. 5. The Mangrove Cave tours allow you to experience waterway tunnels, wildlife and the mangroves all by canoe on a gentle trip that gets you close to nature. Cartagena shore excursions can be had from any cruise line including the cruises from Ft. Lauderdale available from Cunard, Silversea, Celebrity, Holland America and Princess. These lines all have different itineraries for their Southern Caribbean cruises, but all make Cartagena a port of call as they discover the local sights, sounds and landmarks along the coast of the Caribbean Sea. Royal Caribbean cruise deals aboard their Panama Canal cruises that also stop in Cartagena can be had on either westbound or eastbound routes and start at only $1,069 pp. for a 15 day cruise from Ft. Lauderdale to San Diego, or vice versa. Caribbean cruises offer many interesting opportunities for travellers, and Cartagena shore excursions are no exception. 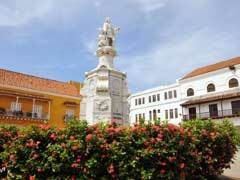 Whether you like to explore on land on in the sea, Cartagena has it all, with history and culture to share.